Microporosity occurs in those places of the casting which solidify last, mainly in places with material accumulations and wall thickness transitions as well as at sand edges (protruding shape and core sections, see Sand edge effect), Figures 1 and 2. 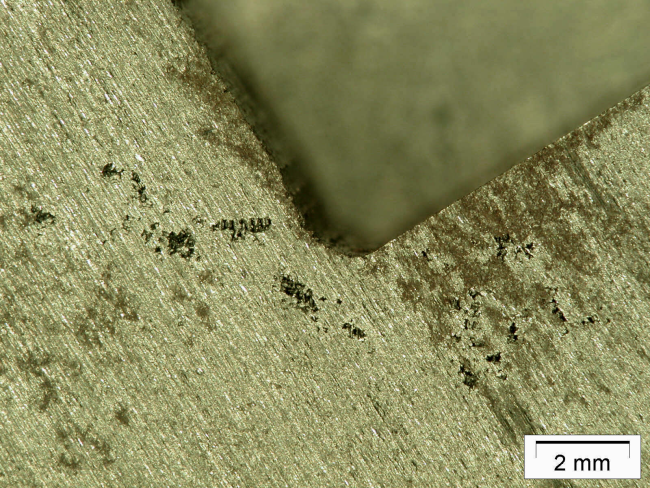 Alloys with a wide solidification interval are particularly susceptible. Microporosity can thus occur in all casting materials, independant fo the molding process. Castings produced in sand molds and with sand core are more prone to defects as gas poroity caused by the mold material may ocur in addition. Moreover, such manufacturing processes use a more or less flexible mold which also contributes to this susceptibility to defects (s. a. Cavities). The defects appear as a sponge-llike, loosened, porous fracture structure and are not always immediately visible to the human eye. Similar to gas porosity, microporosity does not become apparent until the castings are tested for leaks (see Leak test), after machining or during galvanic surface treatment. The pores occurring in the preferred places have a rough-wall internal surface (Fig. 3) and must not be mistaken for gas porosity (smooth-wall and blank internal surfaces of the pores) during the search for the mechanisms of their formation and the subsequent measures for avoidance . 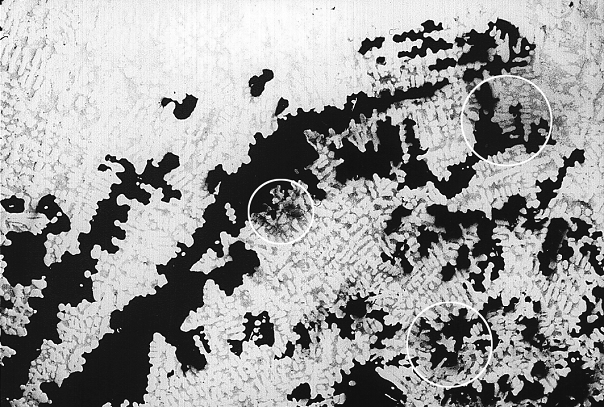 Clear proof of microporosity is obtained on the metallographic specimen (Fig. 4). It is difficult and often not possible to clearly designate and distinguish the relevant causes with absolute certainty in the individual case, as a number of influences apply which are generally closely linked to each other. Microporosity may, for example, occur in a cross section following an increased gas pressure; these are so-called black areas in castings or discoloration in cooper casting alloys, i.e. porosity which is not only caused by the volume deficit but is also a consequence of the gas development by the mold and core mold material. The impairment of the load-bearing capacity due to the weakening of the cross section caused by porosities is minor, particularly in case of evenly distributed microporosities. The impairment is rather caused by the stress concentration at and in the porous areas. These lead to increases stress, the formability is exhausted sooner and cracking or failure are initiated earlier. The impairment due to microporosity due to fluctuating stresses is always greater than in case of static stress so that here the defect frequently leads to rejection, with the position of the porosity with respect to the form of stress being a relevant factor. 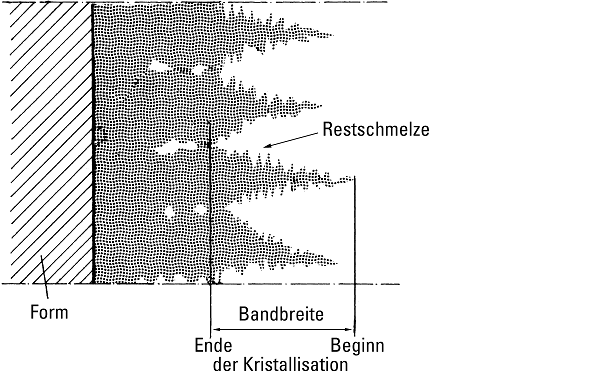 A center line porosity in the neutral fiber of a cross section subjected to bending stresses, for example, will have little negative impacts, whereas porosities on the bending tension side will have serious effects (Figures 5 and 6). In addition to the mechanical influences, porosities also impair the pressure tightness, coatability, and any functional surfaces. 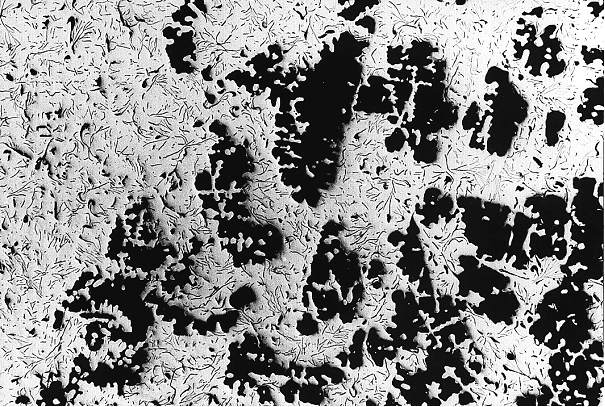 The division of the total volume deficit in macro cavities, shrink marks, external shrinkage, and microporosity depends on the solidification procedure and the solidification behavior which are affected by the composition, the balance of nuclei, the cooling conditions, and the geometric proportions of the casting (s. a. Cavities). The decrease in volume of the casting metal (contraction) during cooling and solidification as well as a mushy solidification itself, gas diffusion from the melt (endogenic gases) as well as gas emission from the mold material (exogenic gases) are listed as basic root causes of microporostiy. In overheated places the solidification is not directional (see Nondirectional solidification). The volume shrinkage during cooling and solidification in these places cannot be compensated by feeding from other areas of the casting and the resulting micro cavities can diffuse gases from the melt or the overheated mold part and thus increase microporosity. Particularly the “sand edge effect" has an extremly negative impact on the occurrence of microporosity (Fig. 1). The known cause of this effect is that the sand edge becomes particularly hot due to the casting material surrounding it which results in delayed cooling of the metal compared to adjacent areas so that this metal can flow into the adjacent areas solidifying earlier. For iron-carbon alloys, the influence of the low-melting phosphorous eutectic and therefore also the segregation of the phosphorous must be mentioned. Moreover, the influence of the graphite expansion during solidification and the influence of the mold strength should be taken into account (s. Cavities). Microporosity in aluminum alloy castings can be interdendritic cavities, hydrogen bubbles or a combination of both. There is a simple procedure for differentiation between micro cavities and gas pores: the “nearest neighbor cluster” analysis with the help of image analysis. This is based on the simple observation that micro cavities occur in groups, i.e. close to each other, whereas gas pores have a wider distribution and a greater distance to each other. The distance between a pore and its nearest neighbor can therefore be used as a differentiation feature. By using a limit value for the distance the cavities can be divided into clusters, where the pore distances are smaller than the critical distance, and in individual cavities. Above a certain hydrogen content determined with 0.17cm3/100g Al, gas porosity and micro cavities occured together in an approximately equal proportion. For hydrogen contents above this limit value no micro cavities on their own were observed. Below the critical hydrogen content, however, micro cavities are the main mechanism for the formation of cavities. Aluminum gravity die casting refeals a smaller total volume deficit compared to aluminumsand casting; the same applies to microporosity. The cause is considered to be the possibility of post-feeding due to the relatively short solidification period while filling the mold in gravity die casting during casting, provided that the die temperature is correct. 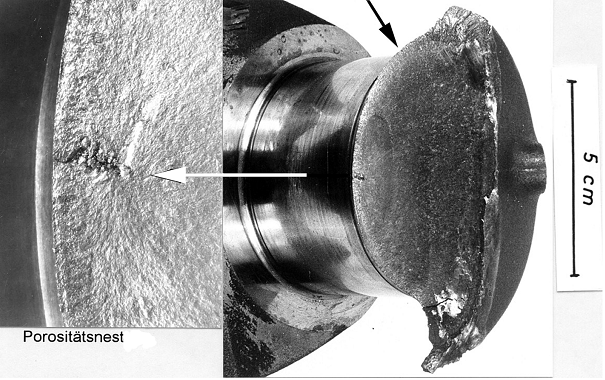 The least microporosities occur in die castings and their causes mainly originate in the shrinkage porosity. 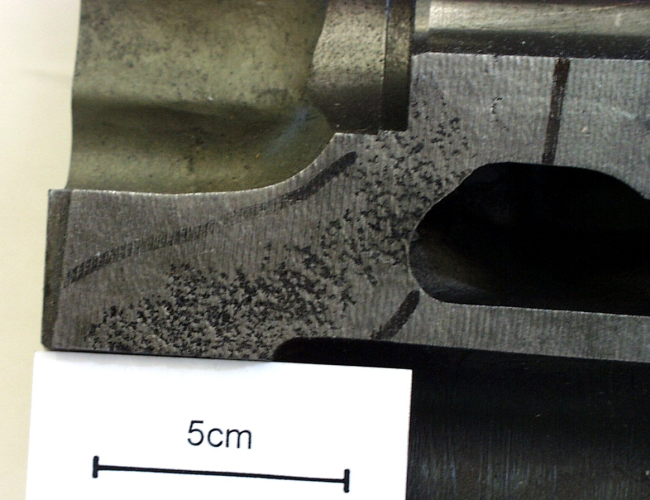 Maximum micro cavities in cast brass is determined at 68% Cu and 32% Zn, and the gunmetals G-SnBz 14 and G-SnBz 20 also reveal zones with severe micro cavities. These cavity forms are explained by the occurrence of a solidification belt (Fig. 7) which refers to the zone in the casting where both, liquid and solid phases occur. 1. Reduce solidification interval, use near eutectic composition, change alloy, if required. 2. Increase of the self-feeding capacity due to the expansion in eutectic graphite precipitation by means of a possibly high eutectic graphite amount which in turn can be achieved by optimum late inoculation (see Inoculation and/or improving the chemical composition. 3. The degree of saturation should always be adjusted as high as possible with the admissible upper limit for gray cast iron being derived from the required tensile strength. In case of strong variations in the analysis it is therefore not recommended to melt “half a grade” harder than required to be on the safe side; instead, the accuracy when adjusting the composition must be improved. 4. In nodular graphite cast iron, the admissible upper limit of the carbon equivalent (degree of saturation) is the limit for graphite flotation. If the CE value is adjusted shortly below the flotation (particularly with thick-walled parts), then the maximum graphite quantity for self-feeding is always ensured. 5. The magnesium content of nodular graphite cast iron should never be higher than required in order to ensure optimum formation of nodules. Every process engineering measure which can be avoided by overtreatment of iron and restricted by Mg scattering reduces the microporosity tendency of the iron. 6. Carbide-forming elements (see Carbide formers) such as chromium, vanadium, titanium, and manganese in GJS should be kept as low as possible because they counteract graphitization and thus impair the feeding behavior. 7. Avoidance of sharp cross-sectional transitions and junctions (see Favorable casting design). 8. Apply cooling ingots or use mold materials with great heat dissipation capacities (zirconium sand, chromite sands) in places at risk. 9. Structural changes in order to avoid “hot places”, i.e. round edges and increase radii. 10. Keep binder contents in mold materials (bentonite and resin) as low as possible, keep water content low. 11. Ensure good gas permeability of the mold material and optimum core air removal. 12. Adjust optimum casting temperatures and times so that even progression of the solidification in the casting is ensured. 13. For iron-carbon alloys, the phosphorous and sulfur contents must be restricted to a minimum. 14. For aluminum and magnesium alloys (sand, gravity die casting, and pressure die casting process), correct conduct of heat, clean and dry melting tools, ladles and charge materials as well as the efficiency of grain refinement and modification must be ensured. Avoid non-metal impurities which suspend in the melt. 15. Reduce gas contents in the melt. 16. For sand casting, design molds more stable by increasing the compacting pressure (see Compaction) and aim for even compaction. 17. Removal of porosity defects by impregnation. Concerning product liability, sealing of the castings must be agreed upon with the customer.